This Demonstration shows edge-to-edge tilings of a sphere with right triangles with one of three choices of dihedral angles: , , ; , , ; and , , (for even ). 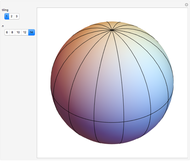 These are all the edge-to-edge tilings of a sphere with right triangles [1, pp. 1–8]. 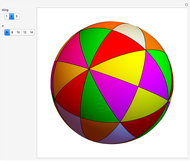 Izidor Hafner "Three Edge-to-Edge Sphere Tilings with Right Triangles"